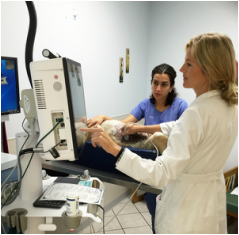 Marina Hills Animal Hospital has ultrasound available onsite. Ultrasound uses inaudible sound waves to create images of internal organs within your pet's body. Additionally, we regularly consult with a board certifed radiologist for our more challenging ultrasound needs. Our veterinarians can use this state-of-the-art technology to assist in diagnosing your pet's heath problems.